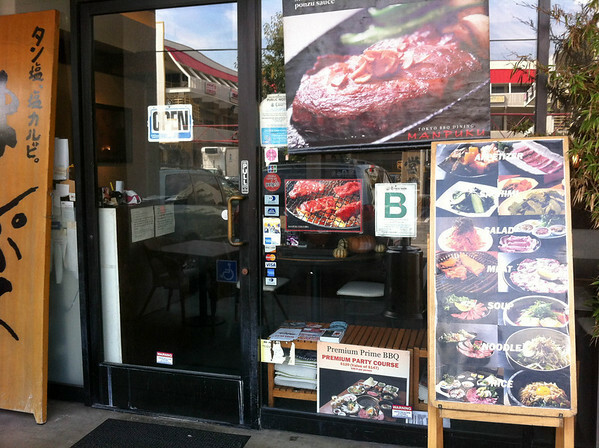 Back when my office was at the Watergarden in Santa Monica Echigo was one of my regular lunch haunts. 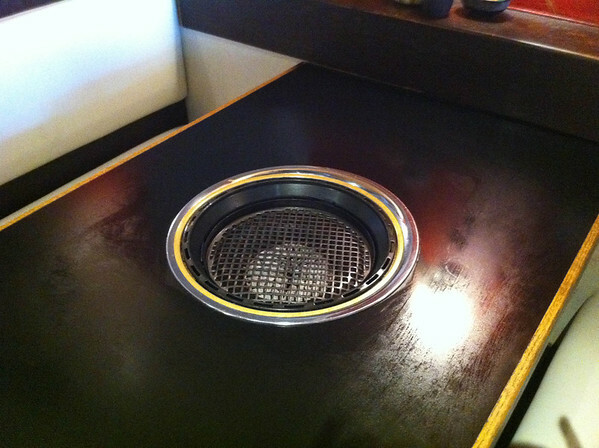 The chef studied under Nozawa and is stylistically related to nearby Sasabune. 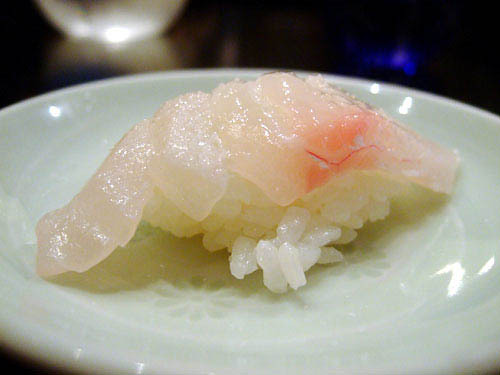 They both follow the “warm rice” school of sushi (which I believe originates in Osaka prefecture. 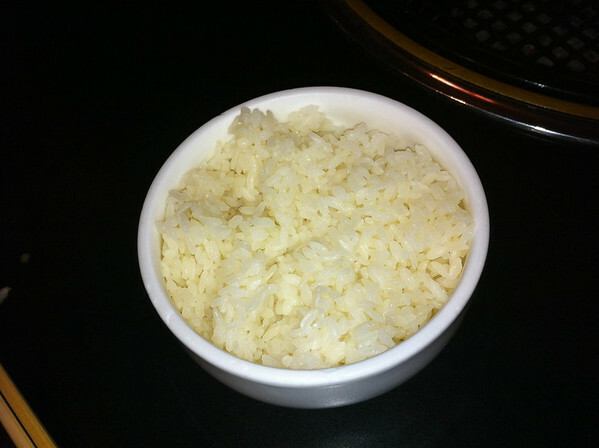 The rice is warmer and less sticky than Tokyo-style sushi. 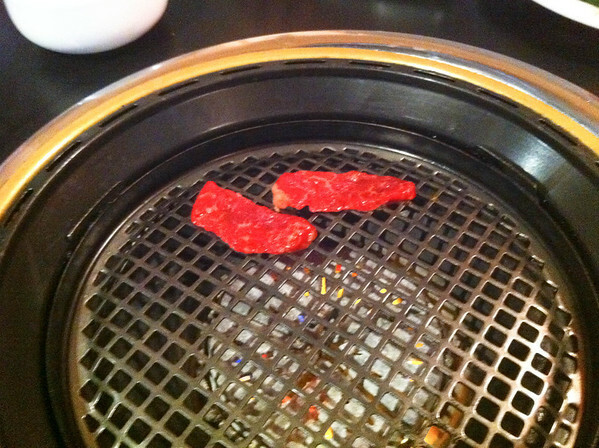 It tastes really good this way, but has some tendency to fall apart on the way to the mouth. 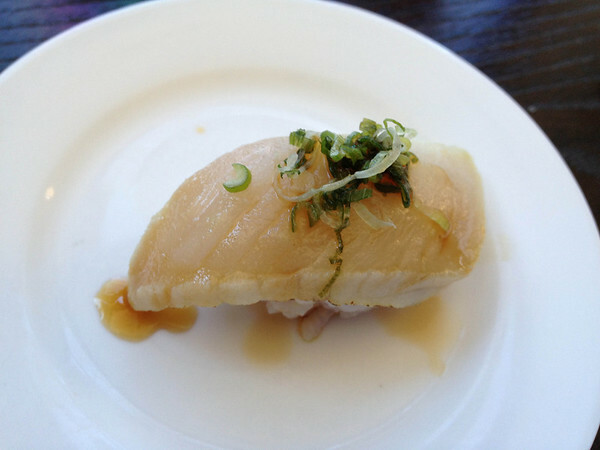 The lunch menu has two choices, the lunch special for $14 and the omakase. Below is the union (both) of each. 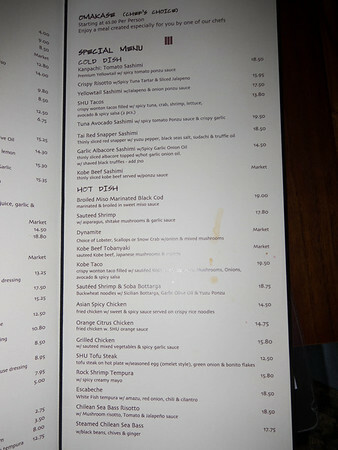 The lunch special is by far the best deal (6-7 years ago it was even $9!). 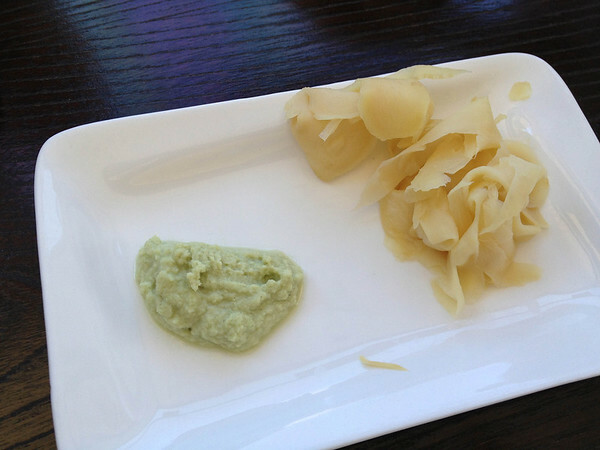 Fresh ground wasabi and pickled ginger. These photos were taken on the iPhone 4S which does pretty well in good light. A few missed photos were purloined from the web. 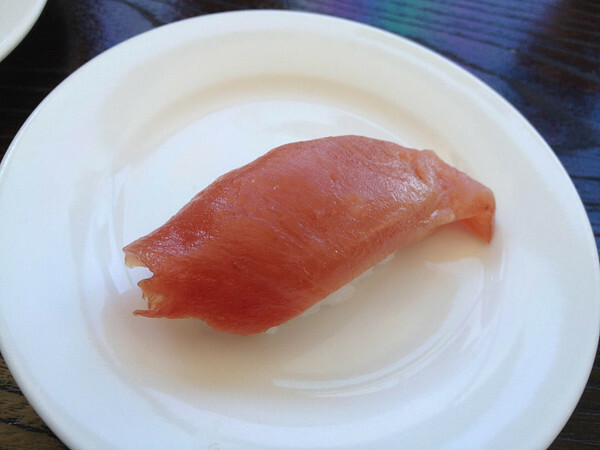 Skipjack tuna with a bit of sauce. Halibut, which itself doesn’t have much flavor, but the vinegary sauce does. 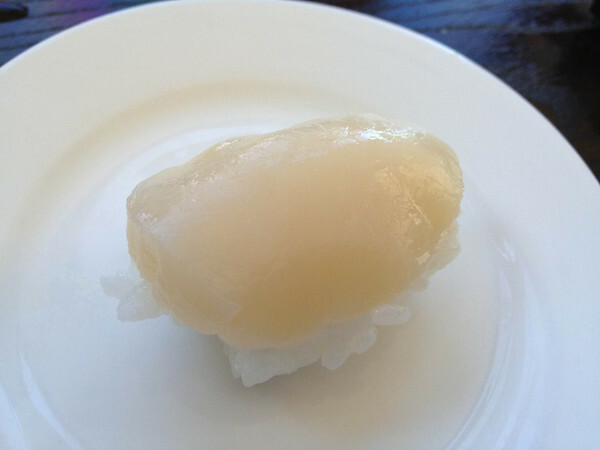 Scallop. One of my favorites. 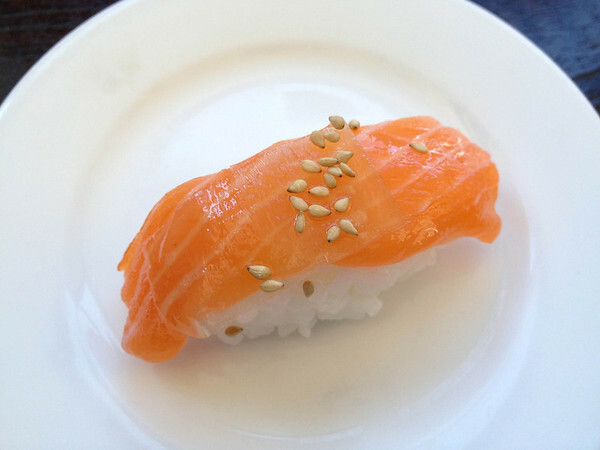 Salmon with a bit of kelp and sesame. 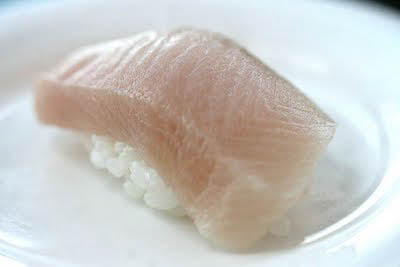 Kanpachi (young yellowtail). With a bright vinegary sauce. 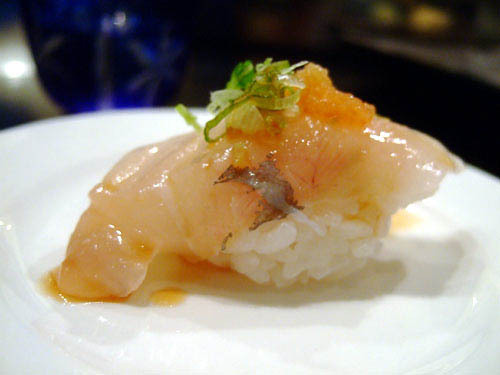 Butterfish. 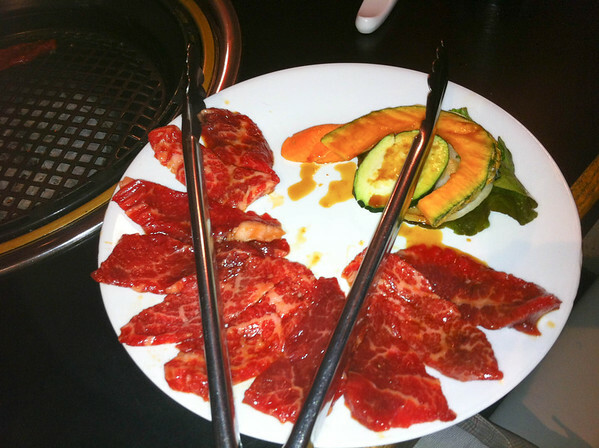 This is an Echigo specialty. 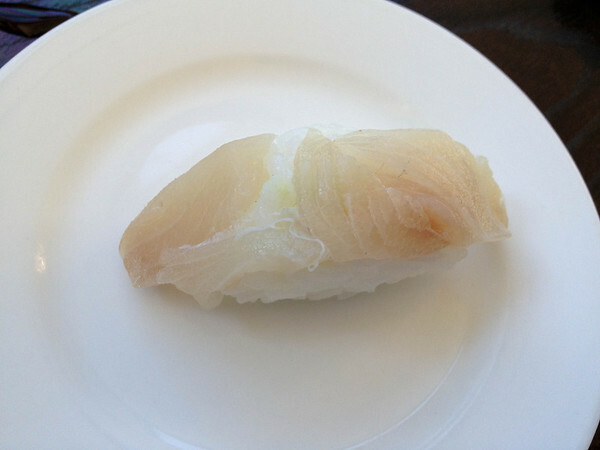 A firm fish with miso based sauce. And the now classic Nozawa blue crab hand roll (I ate two and could have had more). Echigo is a hair below a few of the very top lunch LA sushi places (Sushi Sushi, Mori, Go, Kiriko etc), but it offers pretty good relative value, and on the absolute scale top sushi, far above the generic touristy sushi joint. Getting the Omakase at dinner at the sushi bar is an even higher caliber experience. 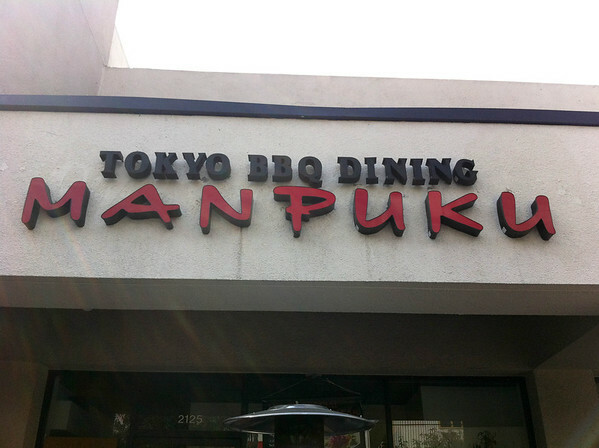 For more LA area sushi, see here. 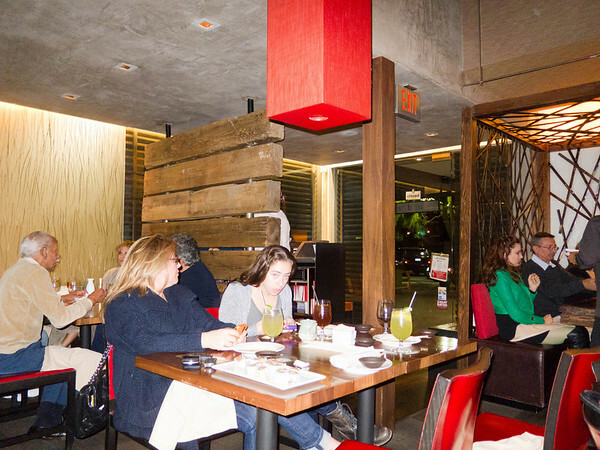 Rating: A great “Nobu” clone with some dishes of its own. 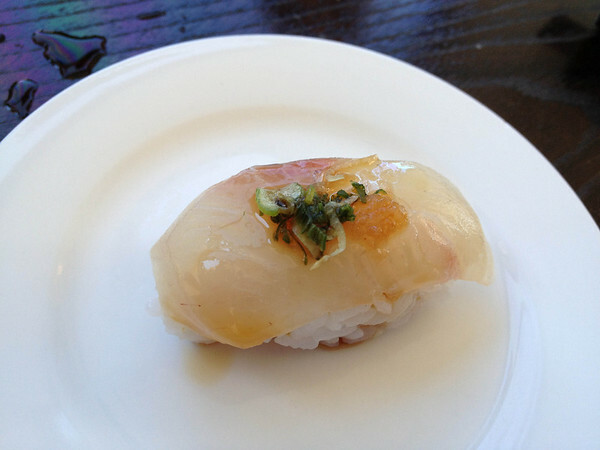 Nearly 15 years ago now when I first ate at Matsuhisa I was blown away. 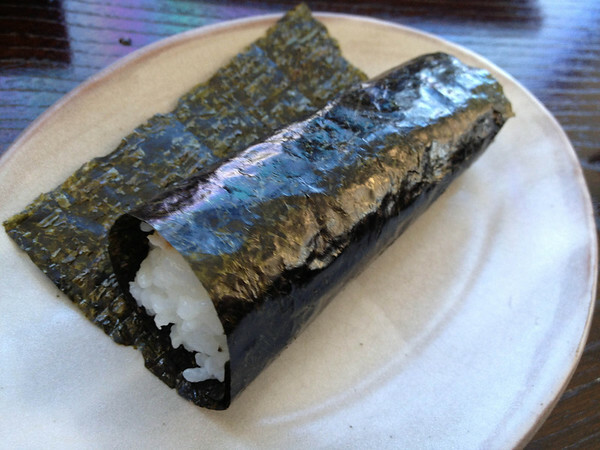 I was already a veteran Sushi eater, having started going to Washington D.C.s one (then two) places in the late 70’s, and having been to Japan 2 or 3 times at that point (now it’s around 20). At the time it seemed like a culinary breakthrough. 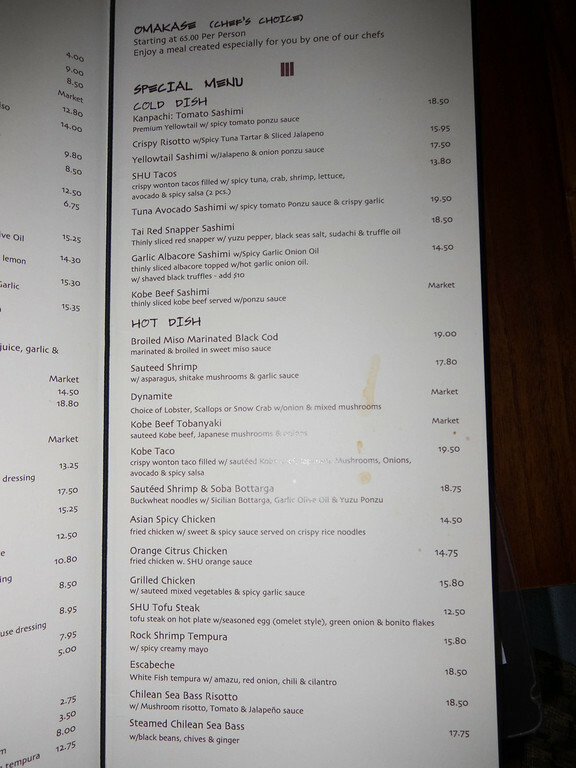 Classic sushi was great, but here was a whole new cuisine based on “modernizing” and combining Japanese elements with some other sensibility. Fundamentally it seemed intensely creative. 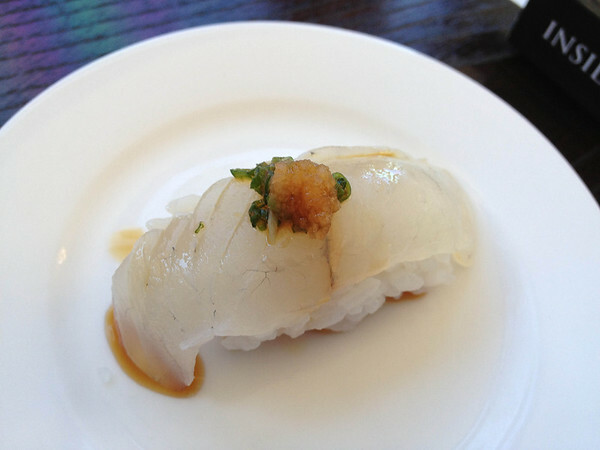 But nowadays half the restaurants in LA have Miso Cod or Yellowtail Sashimi with Jalapeno. 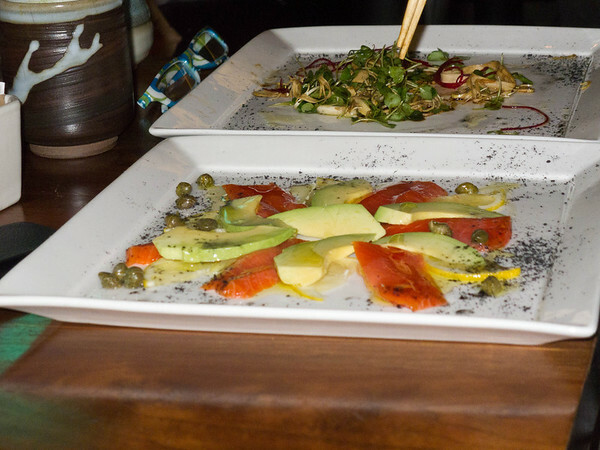 In Food just as in any other art, creativity is surprisingly rare. 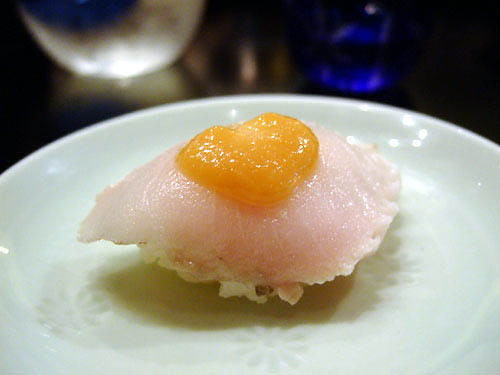 SHU is very much derivative of this tradition, but unlike many of the places (Sushi Ryoku & Katsuya you know who you are!) does add a dash of its own style. 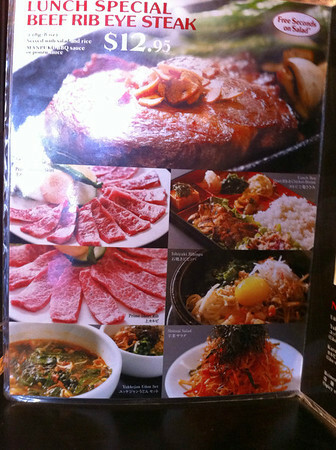 Now we had read that SHU combined Japanese flavors with Italian. As a lover of both cuisines I didn’t really see this. It was more like a 95%/5% split in the Japanese favor. 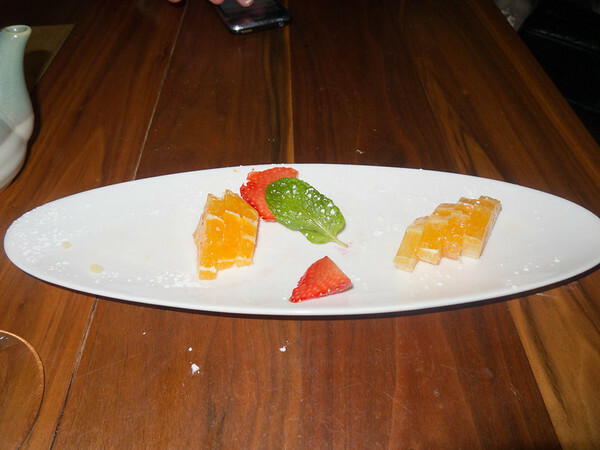 A few dishes had an occasional ingredient pulled from the Italian palette (like Olive Oil), but that was about it. And right. 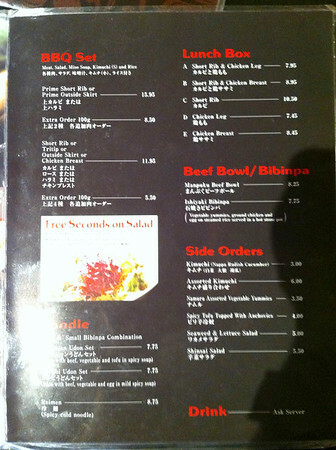 There is also a separate Sushi menu and a specials of the day menu. 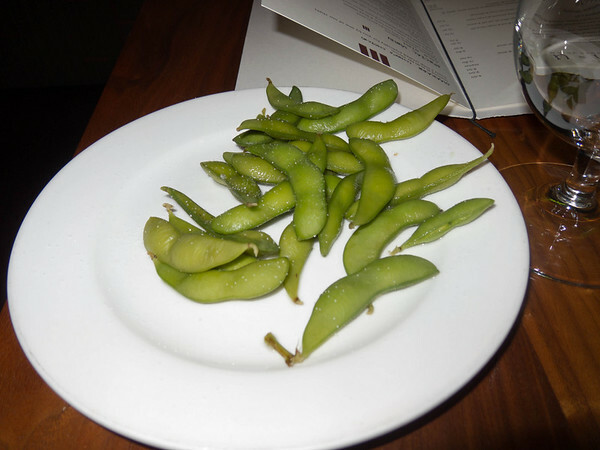 “Edamame,” the usual. They just put it on the table, which some places do. 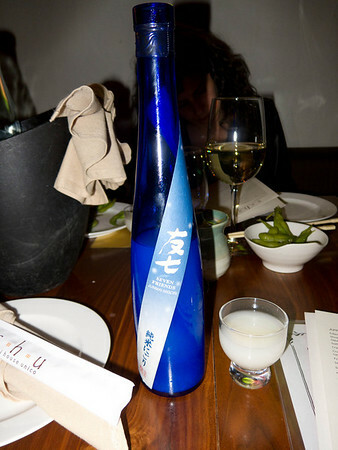 This is unfiltered Sake, served cold. It looks like the Japanese soda Pocari Milk. I liked it, smoother than many filtered Sakes, with a nice “rice” flavor. 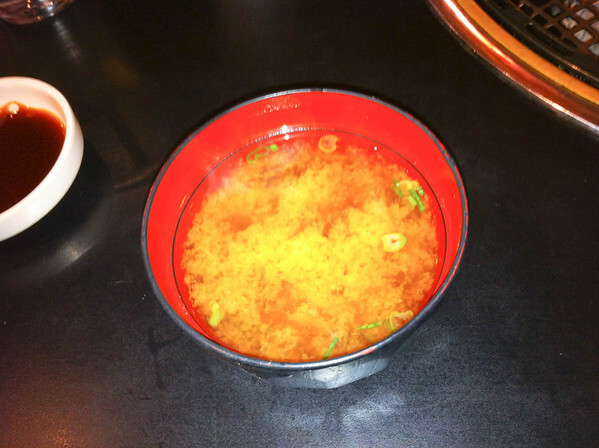 “Miso Soup w/ Tofu & Green Onion,” the classic. Certainly well done, but I object to the presence of the spoon. 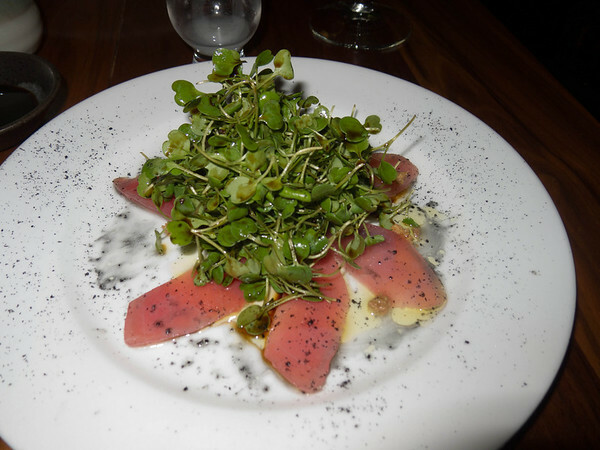 “Tuna Carpaccio. Thinly sliced Tuna w/ arugola, extra virgin Olive Oil, Yuzu & bottarga,” was very tasty, bright, soft, with a pronounced citrus zing and a good dose of black pepper. While it did have Olive Oil, I’d hardly call it Italian — but I liked it! 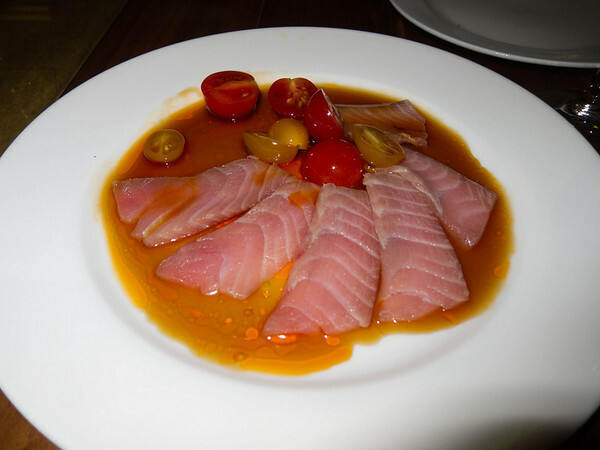 “Wild Yellowtail: Tomato Sashimi,” was nice. 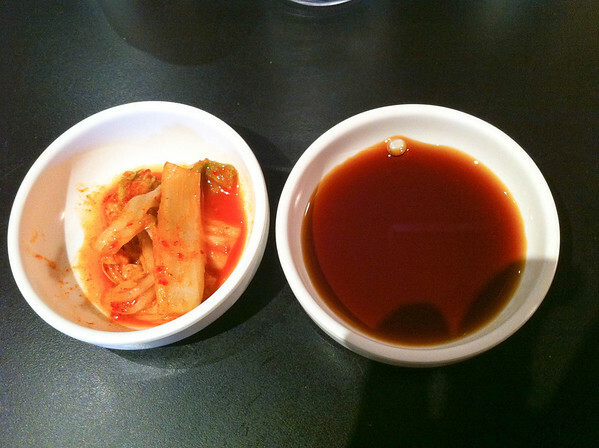 The sauce had a LOT of zing to it, very vinegary in a good way, with a little hint of spice afterwards. 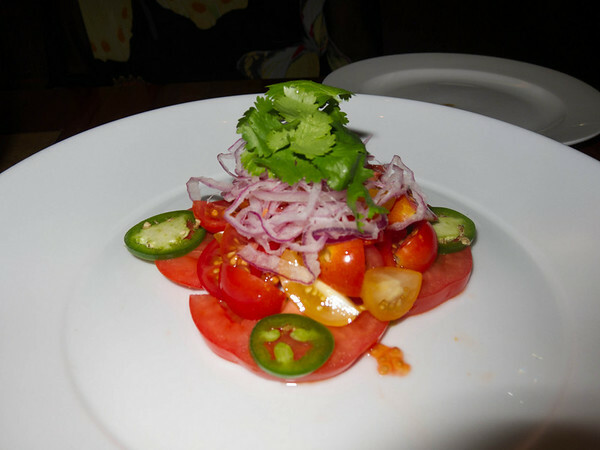 “Heirloom tomato salad with Jalapenos, onion, cilantro and Jalapeno dressing.” I only tried the dressing, as I detest raw tomatoes (one of 2 foods I don’t like). My wife liked it, although it was a chopstick challenge. The dressing was on the side and I used it on some other dishes as it had a great, very bright citrus, vinegar, jalapeno tang. 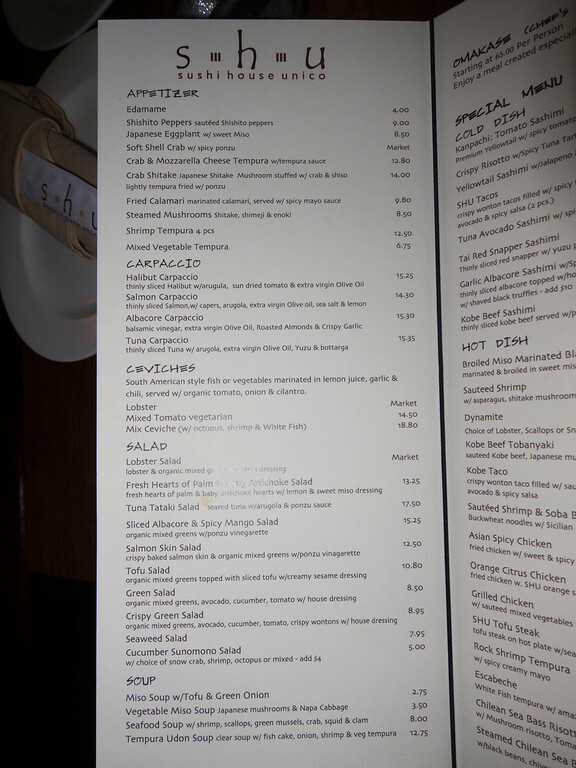 “Salmon Carpaccio, thinly sliced Salmon, w/ capers, arugolo, extra virgin Olive oil, sea salt & lemon,” I didn’t try. 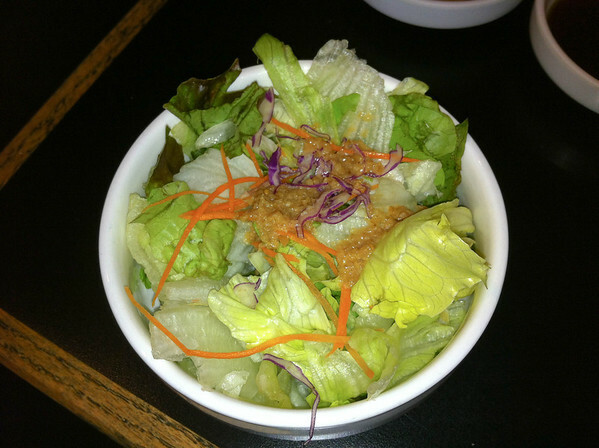 In fact, I didn’t order, but it was so pretty I photoed it from the next table over. 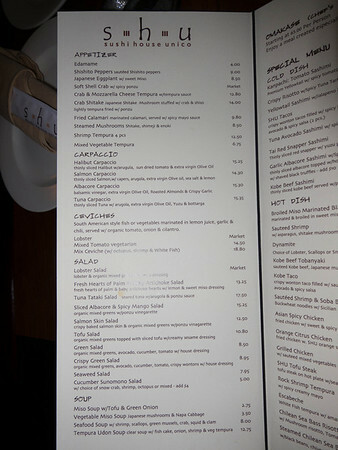 “Crispy Risotto w/ Spicy Tuna Tartar & Sliced Jalapeno” was a very nice dish, but the Risotto name was a total misnomer. 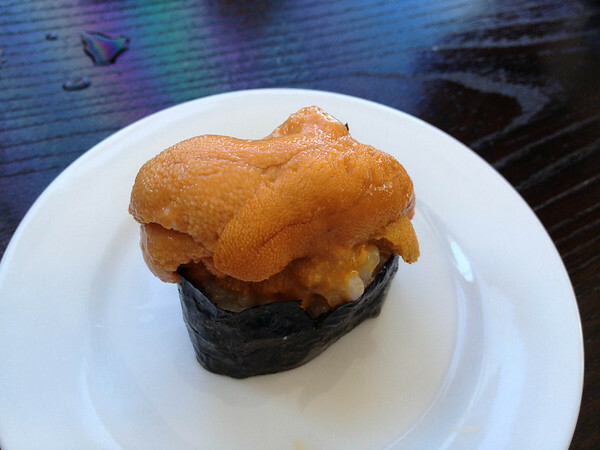 It’s the standard “friend crispy rice cake,” topped with spicy tuna. 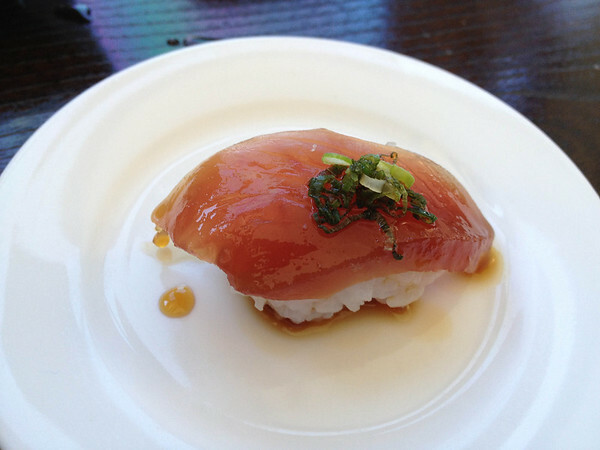 But it was very good, even though I’m not a spicy tuna fan. 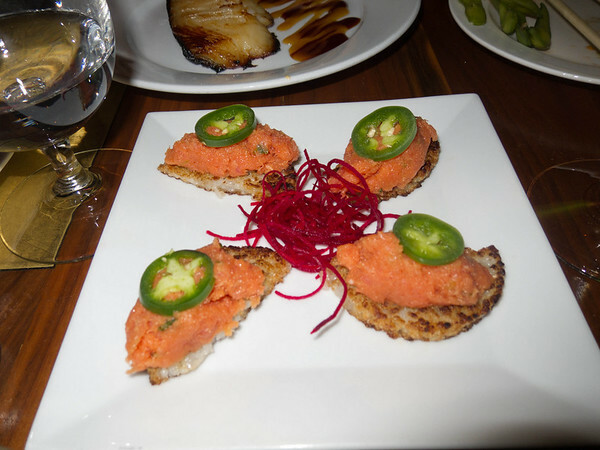 Spicy tuna is to Sushi as Spaghetti and Meatballs is to Italian. 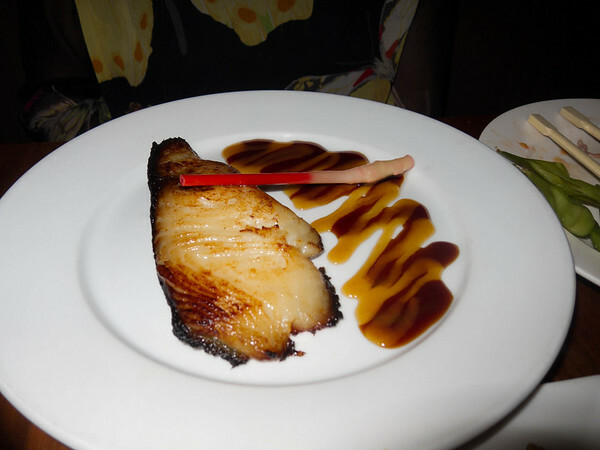 “Broiled Miso Marinated Black Cod,” the Nobu classic and one of my wife’s favorites. 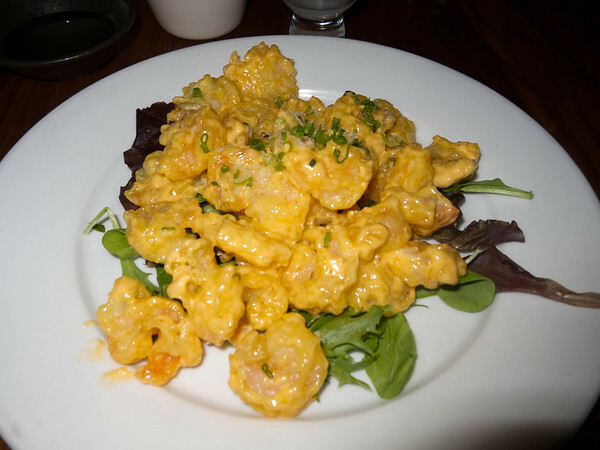 “Roch Shrimp Tempura w/ spicy creamy mayo” is another Nobu classic, but it was done just as well here. Click the pic for a zoom. 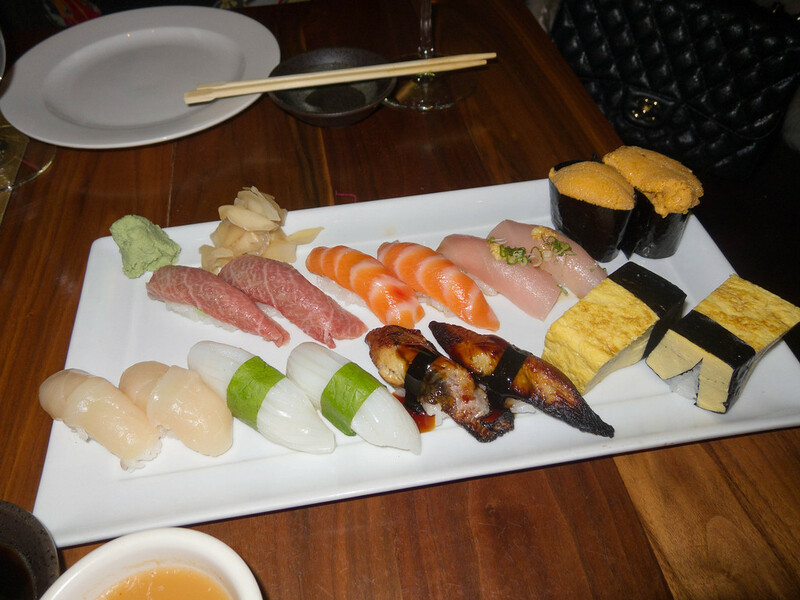 Starting left to right across the top: Toro, Salmon, Albacore, Uni, Japanese Scallop, Eki (squid), Fresh Water Eel, and Tamago (Egg Omelet). 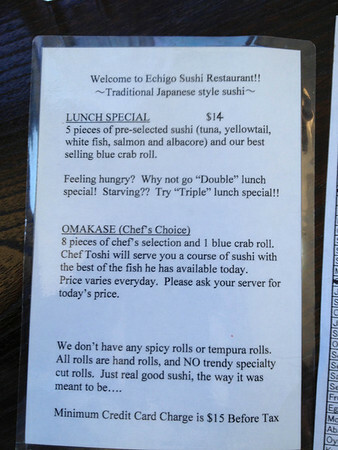 The sushi was excellent. 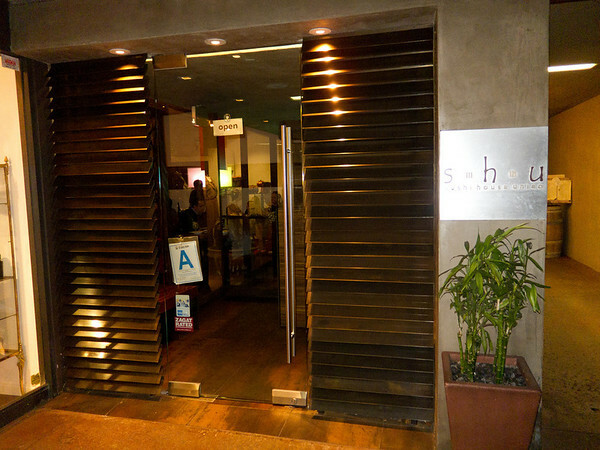 It was just a notch below what you get at Nobu, the late Hump (sob), or other extremely top LA places. So extremely yummy, but not totally sublime. 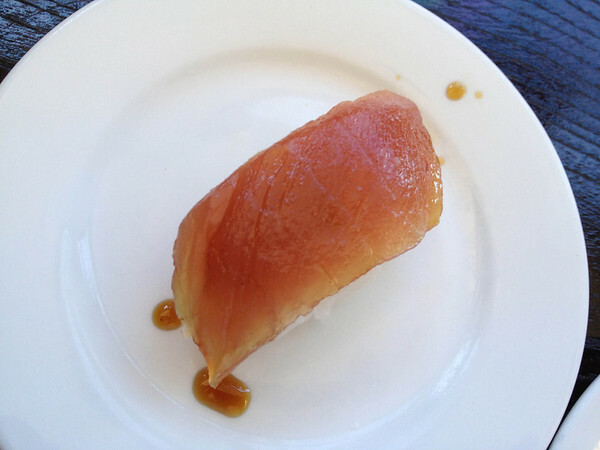 Bear in mind that I am an extreme sushi snob with over 30 years of practice. The unasked, but welcome fruit plate. I was too slow with the camera. And exterior, right next to Vibrato Jazz Grill. Overall, SHU was a very good place. 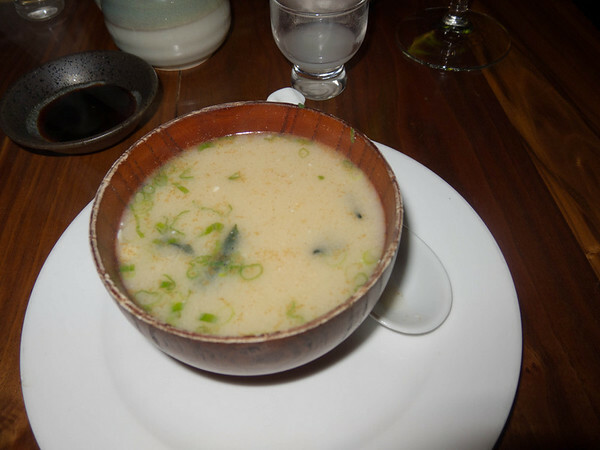 It did the “classic” Nobu dishes well, and added enough originality to give it some flavor of its own.